Marysol Castro remembers a hot and humid summer day between third and fourth grades. She was playing stickball with her brothers and neighbors in her native Bronx, New York, and she remembers some boys looking at her with disdain when she hit her first home run. She noticed the looks, but it didn’t stop her, and it certainly hasn’t stopped her yet. 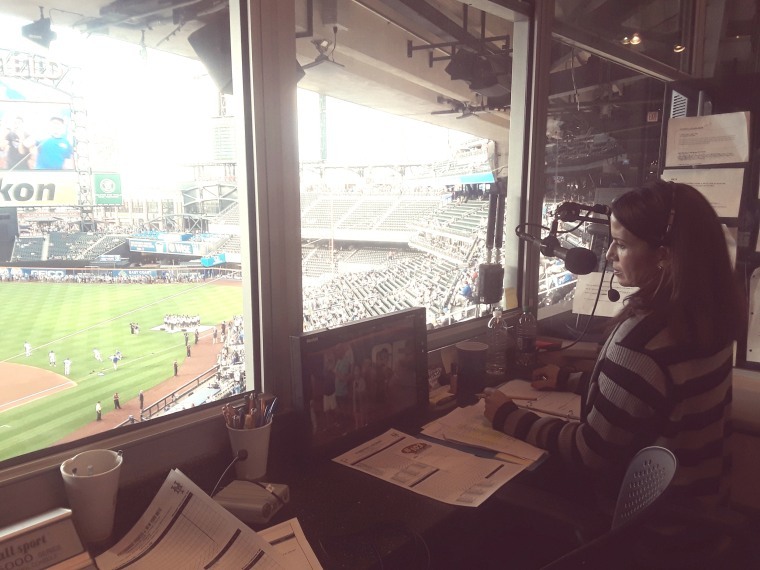 Castro, who’s about to turn 44, has spent a little over a month in her job as the first female public address (PA) announcer for the New York Mets and the first Latina PA announcer in Major League Baseball. During her two-decade career, Castro has worked in local TV news and has been a national network weather anchor on ABC’s “Good Morning America,” and on the “The Early Show” at CBS, as well as a reporter on ESPN — all positions often dominated by men. “I’ve worked really, really hard,” said Castro. Sporting feminine wedge sandals and bright red nail polish, Castro is petite, yet she speaks with an authoritativeness and power that shows she’s used to hanging with the guys and isn’t afraid to speak her mind. Castro was ambitious at an early age; she recalls first wanting to be the shortstop for her hometown team, the Yankees, and then wanting to go into politics. At 12, she decided on her own that she would get a full scholarship to boarding school, and she did. Castro says she knew the world was bigger than the Bronx, and she wanted to see it and learn about it. She taught English at Poly Prep Country Day School in Brooklyn, and it’s there, Castro says, where she learned the power of real communication. After attending Columbia University’s Graduate School of Journalism, she began her career in broadcasting. Both of Castro’s parents were born and raised in Puerto Rico. Her father, who passed away when she was 10, was a U.S. Navy veteran, a NYC bus driver and was active in the Young Lords, a groundbreaking civil rights group, as well as other community organizations. A study showed that the addition of international players to MLB teams, many from Caribbean and Latin American countries, have resulted in a jump of millions in profits. As of last year, MLB players hailed from 19 countries, including the Dominican Republic (93 players), Venezuela (77) and Cuba (23). Castro, who grew up speaking primarily English, went to the Mets Clubhouse on one of her first days on the job and asked each player how they wanted her to pronounce their names. This meant a lot to many of the players, including the 11 Latinos in the 40-member team. The youngest of four children, Castro said that by the time her parents got to her, they realized none of their kids were fluent in Spanish. “So it was important to me to learn it, and I now teach my two boys, Liam and Gavin, Spanish,” said Castro. On the days she’s not announcing for the Mets, she hosts “The Weekly Good” on OGTV, and “Somos,” where she highlights exceptional Latinos; she enjoys using her storytelling to counter negative news. I had no idea that was only the second day on the job for @marysolcastro, the first female PA announcer for the Mets. Congrats on making history! Her advice for getting ahead? Reading everything and asking random questions has always helped her. In many ways, she’s still the scrappy girl with the confidence to play stick ball with the guys.